UPDATE: Version 1.1.1 now out, fixes a silly little problem of my new build process not including a file needed for the dialect to work with the Thymeleaf Eclipse plugin :| Sorry about that one. First of all, I've just released version 1.1 of my Thymeleaf Layout Dialect, but with a little (or big, depending on much you use the dialect and your own workflow) caveat: I've changed the package name and XML namespace used for the dialect, dropping the 'web' part that was in the package/namespace. It's something I've been doing to all my other projects that were initially web-only projects, so I thought it was a good thing at first to have that 'web' part in there to indicate that, but as time went on I found the name had lost its meaning as my web projects became useful in non-web contexts. The latest version of the Layout Dialect in particular has included in it some refactoring work to make it not so web-specific so that it can process XML documents just like Thymeleaf itself can do. For most of you, a quick find-and-replace in the IDE / text editor of your choice over your projects should fix things up. Check out the link above for the full change log, or visit the GitHub page for the exact same details. In related news, I'll be representing Thymeleaf at the SpringOne 2GX conference in Santa Clara this September! :D The session abstract summarizes what I'll be talking about better than I can write just now (it took me a good afternoon to come up with that abstract! ), so give that a read over at the SpringOne 2GX page. I don't travel out of New Zealand much, so I'm turning this into a little bit of a holiday too, spending a while in San Francisco before I head to Silicon Valley to attend the conference. I've been asking any and all friends I meet if they've been to that part of the world and what they did there, just so I can get some idea of how I can be all touristy. I'm rather unprepared for overseas travel, let alone travel AND speaking at a conference. My passport is sure to have expired (*checks passport...* Yep, it's expired. ), and I've never really given a presentation before, although the public speaking aspect of it is the least of my worries. Do people still give this kind of advice to others? 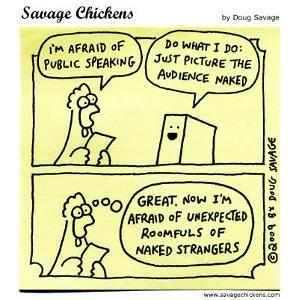 I've never had trouble speaking in-front of a group of people, despite it being one of the things many people are most afraid of - more afraid of than death, if I remember the old wisdom on the subject. The last time I stood-up and spoke before a group was, funnily enough, at a local Toastmasters meeting to which I was invited to by my old guitar buddy. I'm actually more worried about putting together the presentation. One: I don't have a laptop to take with me, so I got myself a keyboard case to transform the iPad into the next best thing. Two: I've never put together slides for a presentation, or talked to slides before. I've seen more than enough slides in my lifetime though (note: anybody who works in an office environment and attends meetings has seen more slides than they ever needed to see by age 28) to let me know what I do and don't like about some of them, so I hope second-hand experience is all I need to put together something that helps with my talk. Right now though I'm being told over and over to get the flights sorted first, so I'll do that, then I can focus on putting together the story I need to tell, the talking points I want to make, and learning how to use the Keynote app to create visual aids that help it all along.